Who's gearing up for Thanksgiving? We are, and at the Evans household that means testing out new kinds of pie so we can pick The Ones for the big day. I personally don't care about getting the pies exactly right, but Phillip does. Actually, he just likes to eat (and therefore bake) pies and is using "testing for Thanksgiving" as an excuse. And I have to admit that "doing research for Thanksgiving" sounds a lot more respectable than "eating pie for breakfast two days this week." At the recommendation of several friends, I've started reading Simplicity Parenting and it turns out you can't read it without wanting to throw away every piece of junk you own. At least I can't. I started with our gigantic game cupboard: it was crammed to overflowing, with many games we don't play or games missing pieces that were eaten by the baby long ago. My 12-year-old must've seen the frenzied look in my eyes as I ripped everything out and started piling up boxes, because she asked "Mom, you really like to throw stuff away, don't you?" Well, after tossing or donating half the contents of the game cupboard my new favorite thing to do in my free time is throw open the doors and fawn over the beautifully organized inside. So yes. Yes, I do. So anyway, no picture. But really, the food was beautiful and delicious. Ordinarily I don't even like seafood, and I ate every bite. I don't mean to brag, but I'm sort of an accomplished food arsonist. I'm not saying we eat like this all the time, but it happens. This week my oldest daughter's church youth group put on a special program. Each girl put together a display and showcased a 10-hour project she completed in Personal Progress, which is like a church version of the girl scout merit badge program. As I watched the different girls talk about their projects I was struck by how much I love the Personal Progress program. At a time when teens left to their own devices might just hide in solitude behind their earbuds, Personal Progress gives them productive things to do with their families. One girl composed a piano duet and played it with her mom. Another did a family hike up a mountain. Someone else made her prom dress with her aunt. My daughter learned how to cook and then taught her younger sister, so her display was easy: just bring in some kitchen paraphernalia. However, finding presentable-looking kitchen tools in our house is easier said than done. Let's see, should we send it the cheese grater with the broken top? 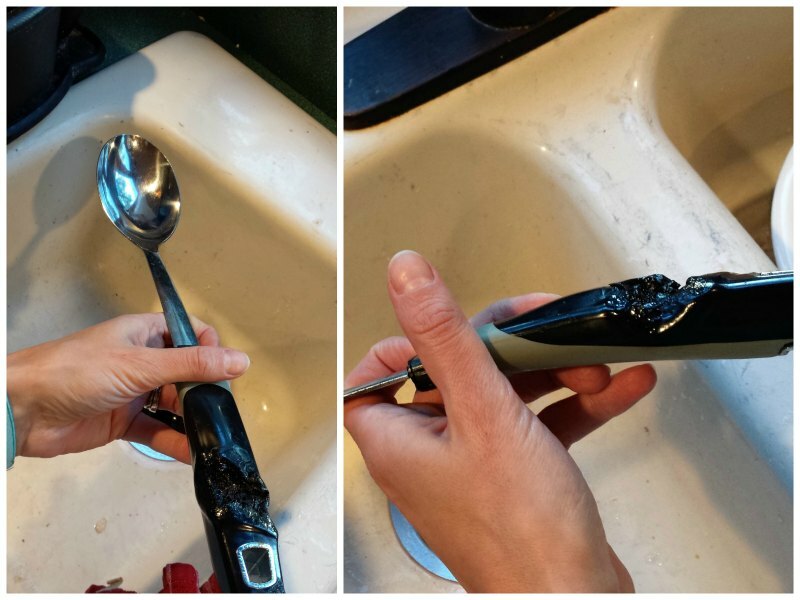 The handle-less serving spoon? The pot with the lid I burned so badly it's permanently discolored? The spatula with the giant gouge melted off from when it fell onto the heating element in the dishwasher? Still in active daily use. You don't get to go on disability if you're an Evans kitchen tool. You work for us until the day you drop dead. So many ways to say mediocrity in the kitchen, each one more impressive than the last. Is anyone having trouble posting comments to my blog? I got an email from a reader saying that their comments weren't posting, even when they used a different device. As I write this, it occurs to me that if you're having a similar problem you can't comment to answer this question. But maybe you could email me? Send me a Facebook message? If this is happening to other people too, I'm going to install a new commenting widget so I can hear from all of you. According to what I read on the Internet and the merchandise I'm seeing in CVS, I should've started my Christmas shopping in August. By now I'm probably supposed to be finished with that and shopping for next year. Buuuuut I haven't done a blessed thing yet except for setting up an Advent giveaway for you guys. Don't make me feel like the lady who slaves over a hot stove making a dinner no one eats. 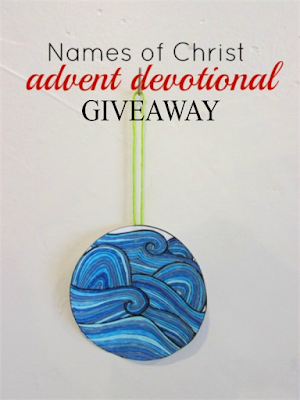 Go here to read a review and enter to win a digital copy of the Names of Christ Advent Devotional created by my artist friend Heidi using Bible verses and some sweet Zentangle action. Your kids will love it. My cub scout is learning about Internet safety for his Cyber Chip, and I've been dying laughing listening to him work through the videos and games he's required to watch and do. In the "netiquette" section, he played a video game with different bad guys exemplifying bad netiquette. My favorite was Pottymouth Pete, who grumbled unintelligible curses whenever he was onscreen just like Joe Pesci in Home Alone. If you see something online that makes you sad, scared, or confused, what should you do? I thought that one was a trick question, though, because I don't think A is supposed to be the answer but aren't kids always screaming real loud? I feel like all adults should have to take a course on netiquette before they have access to the internet. Haha. The church program sounds perfect for pre-teens and teens. I love all the different projects! There are only two of us in our house but our kitchen tools are slowly melting/disintegrating/dying. Ha. I'm glad you've found Simplicity Parenting! Throwing things out (or throwing them into the "donate" pile...either way) Feels. So. Good. I hope to do a lot more throwing out this Advent. "You don't get to go on disability if you're an Evans kitchen tool. You work for us until the day you drop dead." Too funny! ---> We must have the same kitchen tool benefits package. Except all the on-the-job accidents involve either teeth or hot stoves. Maybe we should get one of those "___ days since last accident signs?" Except it would always be at 0. Nevermind. It would just be demoralizing. That video is HYSTERICAL. Sometimes I swear that happens behind the scenes on instagram. The netiquette course is too funny! Oh heavens, I'm dying-these are all hilarious! And that's really good to know about Simplicity Parenting-I should probably stay away from it if I want anything to stay in my home. I'm a little bit of a minimalist, and someone recently added me to a motherhood+minimalism group on FB, and after looking at pictures and projects people were posting, I went CRAZY. My poor 5-month-old must have thought me insane as I ripped through cupboards and closets, piling stuff into the trash, recycling, and a growing pile of "give away" items. But yes, like you, I have stood in my closet to gaze admiringly at my now much-cleaner, much more organized, less cluttered space. Why is that funny? Who doesn't get cheered up by chucking out stuff that they don't need, don't want, don't use, and no longer have to clean up and organize? It's a great program. The talent was amazing. I witnessed a girl doing a solo on the euphonium. That's right, the euphonium. Crazy town. I am loving that last suggestion. And I totally agree. Oh my goodness, I totally had that problem while reading Simplicity Parenting too! Haha. And that pie tasting thing is totally genius. We're totally not ones to shy away from eating dessert for breakfast! I have always wanted to have my Christmas shopping done by August, but I never manage to do it either. I do try to get a few things throughout the year though as I can. I LOVE going through all the stuff in my house to donate or throw out. It's my favorite. Like scratching a really bad itch. Huge kudos on the now organized games cabinet!! Keep breathing that fresh air, Mama!! Never had any problems with commenting here. oops! I meant the video at #3. The pies for breakfast is just sheer genius!! I LOVE throwing things away. My house stays pretty empty naturally but I sometimes go and organize and throw things away at my parents' house and it's very fun. That internet safety quiz question was too funny! Glad they have that course, though--I taught a class on using social media wisely this year to my teens--very important for them to learn about and know they have adults they can talk to tricky online situations about! No ALDI, but we used to live a few blocks from one in Ohio and I loved that place. Phillip uses his mom's pie crust recipe and just substitutes GF flour (he makes his own blend, but Bob's Red Mill would work just fine.) But he hasn't been totally happy with it so he's been experimenting. He just tried an oat flour/sorghum flour/tapioca flour crust (with an egg) - taste was okay but texture needed improvement. We're still on the search. Jenny, loved this post! And we may not have in common things like six kids, but we do have in common a love of getting rid of stuff! My husband can't believe his luck, marrying a woman who hates to shop and loves to get rid of stuff!